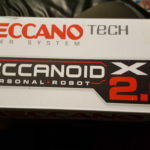 Some weeks ago, I received the Meccanoid XL 2.0 as a review copy. Unfortunately, it was only a few weeks later that I found time to commit myself more closely with this new humanoid robot from Meccano. Even though I got the Meccanoid free of charge, this is a neutral report. Here are my first impressions after the assembly and the first hours of the „programming“. The Meccanoid XL 2.0 is the successor of Meccanoid G15KS and its smaller G15 version. Even the G15 has received a successor with the Meccanoid 2.0 (excluding XL). 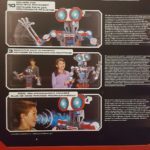 The number of parts has been reduced slightly compared to its predecessor, and the previously existing building instructions for a dinosaur are missing on the robot now. 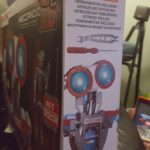 There’s a new „Meccasaur“ Dino robot now as a separate product. Also accounted for, is the ability to control the robot through a Smartphone by controlling the movements in front of the camera. This option was apparently completely removed from the app and is also no longer available for the G15 or G15KS. Newly added are over 3000 new gestures and language editions, as well as possibilities of speech recognition. The understood vocabulary of the robot was so significantly expanded compared to the previous version. The Meccanoid XL 2.0 has a size of 1,20 m, what makes him to be really impressive, and an absolute eye-catcher. The Assembly was largely problem-free; however I must confess at this point that I am a newbie in Meccano. 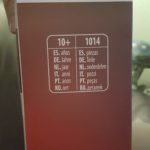 The instructions could have been given in better quality, so it was difficult to identify building steps and the corresponding correct holes for the screws in some places. You should take special consideration on the cable guide, because this is neglected in the building instructions’ manual. Here planning and thinking is required, whereby the degree of difficulty is rather aimed at advanced hobbyists. Even the assembly time of 5-6 hours proves to me that this is not a robot Kit for beginners. The specified minimum age of 10 years here, in my opinion, is somewhat young. Certainly, children need assistance by an adult when reassembling. The parts are different from what Meccano usually offers, not made of metal but of plastic. Meccano has already received criticism online for the plastic parts, but they did not disturb me. The motors of the robot parts made of iron would be more overworked than with new plastic model. Unfortunately many of the components are very specialized, creating one’s customized building is complicated. The hope here is that a few days ago on the Meccano Facebook page, there was posted a video, belonging to a new „Meccano mega builds“ series. This series presented alternate building possibilities in combination with other Meccano sets. Also present is a video for a new „Mecca spider“, a robot spider based on the Meccanoid and the 25 in 1 4 x 4 off-roader set. Unfortunately, I have promised instructions in the video not yet on the Meccano site, but I have already informed the support team. Please more of such alternative models are for the meccanoid set! 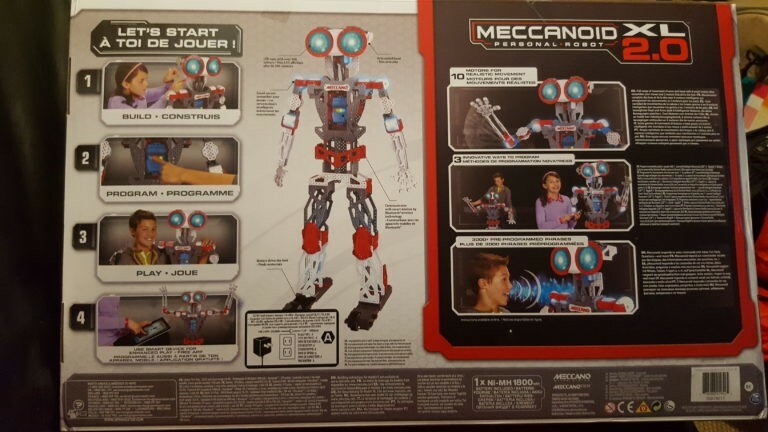 The Meccanoid can be adjusted to different types of „Programming“. Movement can be recorded by the movement of the limb and play back by the push of a button. This is not of course the correct programming, but it can very quickly store movements, which can then be retrieved. This „programming mode“ is suitable for everyone who shuns the correct programming. Another mode is the recording of motion sequences with the Meccanoid app (for Android and iOS). 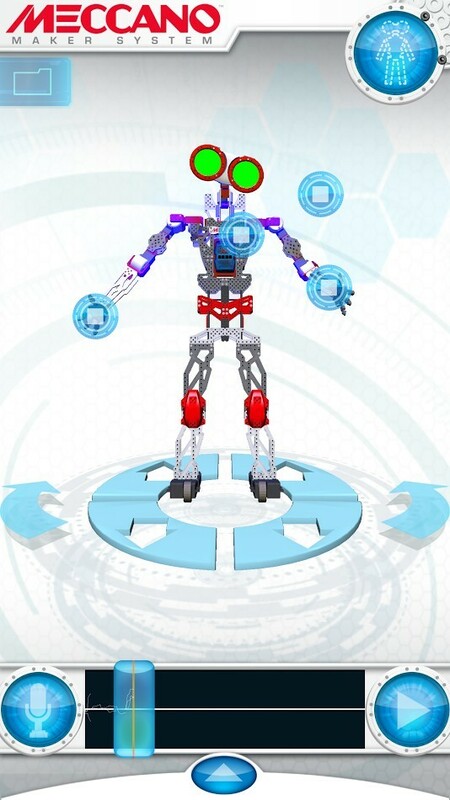 In the app is a virtual robot available whose movements can be transferred to the real Meccanoid. This method also provides no proper programming, it also only records movements. 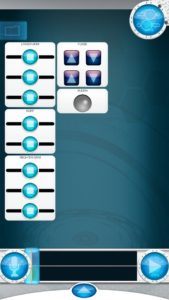 Correct programming, however, is possible with the „drag and drop – programming“ in the app. Here simple programs can be put together, which is similar to how a flow chart is built. It can be used on events (inputs) such as time, engine movement, button pressure, etc be it responsive and affiliated movements, speech, LED color change and other operations will be launched. Here we can also easily learn how to program operations and programming constructions (loops, conditions). Since the Meccanoid contains no additional sensors, the possibilities here unfortunately are somewhat limited. 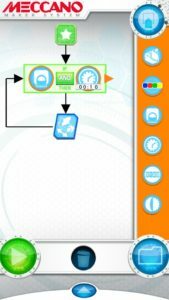 The app offers an interactive tutorial with an English language edition and German subtitles. 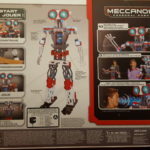 Appealing to children here is the ‚Coach Meccanoid‘ virtual robot that gradually step by step guides them on using the app. 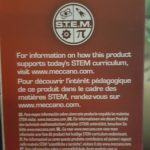 Is the Meccanoid good for use in the classroom? No. With a construction period of 5-6 hours, the building period will take too long for teaching. The learning processes through movement of the robot offers no learning effect. The use of the built-in voice control and dialog function (which did not want to work with me in German), is based on volume which is not suitable for a class room. Drag- and -drop programming is certainly suitable for the classroom, unfortunately there is the lack of tasks set or instructions for the teaching of Meccano. The introduction to simple programming sequences can be taught with some adequate preparation. Additional advanced features give hope that the Meccano can provide a download portal for „open source programming“. Here you will find sample projects and libraries to control the meccanoid by third-party hardware. 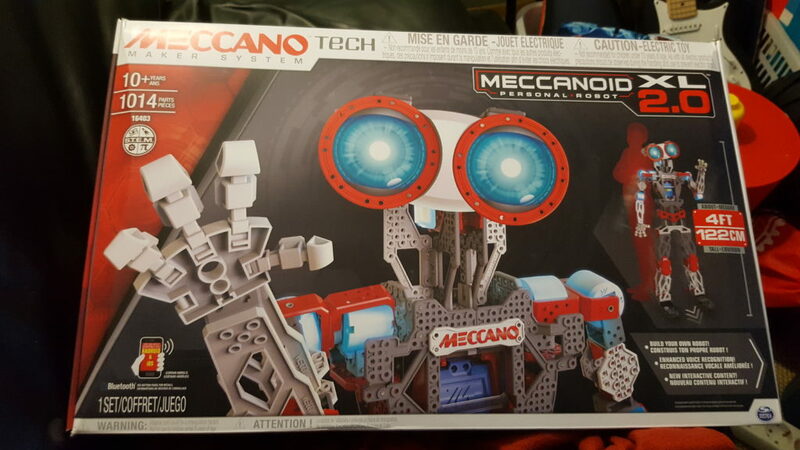 As far as my impression of the Meccano Meccanoid XL 2.0, should you have questions or suggestions, you would like to use the comment function. Pictures and videos of the set up will be available here soon. Vor einiger Zeit habe ich den Meccanoid XL 2.0 als Ansichtsexemplar erhalten. Leider habe ich erst einige Wochen später die Zeit gefunden, mich genauer mit diesem neuen humanoiden Roboter von Meccano zu beschäftigen. Auch wenn ich den Meccanoid kostenfrei erhalten habe, handelt es sich hierbei um einen neutralen Bericht. Hier nun meine ersten Eindrücke nach dem Zusammenbau und den ersten Stunden der „Programmierung“. 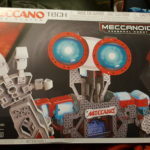 Der Meccanoid XL 2.0 ist der Nachfolger des Meccanoid G15KS und seiner kleineren Version G15. Auch der G15 hat mit dem Meccanoid 2.0 (ohne XL) einen Nachfolger erhalten. Die Anzahl der Teile wurde im Vergleich zum Vorgänger etwas reduziert und die zuvor vorhandene Bauanleitung für einen Dinosaurier Roboter fehlt nun. Dafür gibt es nun einen neuen „Meccasaur“ Dinoroboter als gesondertes Produkt. Ebenfalls entfallen ist die Funktion den Roboter durch ein eingesetztes Smartphone über das Vormachen von Bewegungen vor der Kamera zu steuern. Diese Option wurde anscheinend vollständig aus der App entfernt und steht somit auch nicht mehr für den G15 oder G15KS zur Verfügung. Neu hinzugekommen sind dafür über 3000 neue Gesten und Sprachausgaben sowie Möglichkeiten der Spracherkennung. Das verstandene Vokabular des Roboters wurde zur Vorgängerversion also deutlich ausgebaut. Der Meccanoid XL 2.0 hat eine Größe von 1,20m, was ihn zu einem wirklich beeindruckenden Roboter macht, ein absoluter Blickfang. Der Zusammenbau verlief weitestgehend problemfrei, allerdings muss ich an dieser Stelle gestehen, dass ich ein Meccano Neuling bin. Die Bauanleitung hätte in besseres Qualität vorliegen können, sodass das Identifizieren von Bauschritten und der dazugehörigen richtigen Löcher für die Schrauben an einigen Stellen schwer erkennbar war. Besonders Rücksicht sollte man auf die Kabelführung nehmen, da diese in der Bauanleitung vernachlässigt wird. Hier ist Planen und Mitdenken gefordert, wodurch sich der Schwierigkeitsgrad eher an Fortgeschrittene Bastler richtet. Auch die von mir benötigte Zeit von 5-6 Stunden für den Zusammenbau zeigt, dass es sich hierbei nicht um ein Roboterset für Einsteiger handelt. Das angegebene Mindestalter von 10 Jahren ist hier, meiner Meinung nach, etwas jung. Kinder brauchen hier sicherlich Unterstützung durch einen Erwachsenen beim Zusammenbau. Die Teile sind, anders als sonst bei Meccano üblich, nicht aus Metall sondern aus Plastik. Meccano hat dafür online bereits Kritik einstecken müssen, mich störten die Plastikteile aber nicht. Wären die Roboterteile aus Metall, wären die Motoren noch überforderter als jetzt schon. Leider sind viele der Bauteile sehr spezialisiert, wodurch das freie Bauen von eigenen Kreationen sich als kompliziert gestaltet. Hoffnung macht hier, dass vor wenigen Tagen auf der Meccano Facebook Seite ein Video gepostet wurde, zugehörig zu einer neuen „Meccano Mega Builds“ Serie. in dieser Serie werden alternative Baumöglichkeiten in Kombination mit anderen Meccano Sets vorgestellt. Neu ist hier auch ein Video für eine „Mecca Spider“, eine Roboterspinne basierend auf dem Meccanoid und dem 25 in 1 4×4 Offroader Set. Leider habe ich die im Video versprochene Bauanleitung noch nicht auf der Meccano Seite finden können, habe aber bereits den Support darüber informiert. Bitte mehr solcher alternativen Modelle für das Meccanoid Set! Motorenbewegung, Knopdrücke, etc reagiert werden und daraufhin Bewegungen, Sprachausgabe, LED Farbwechsel und andere Vorgänge gestartet werden. Hier lassen sich auch erste einfach Programmabläufe und Programmierkonstrukte (Bedingungen, Schleifen) erlernen. Da der Meccanoid keine zusätzlichen Sensoren enthält, sind die Möglichkeiten hier leider etwas begrenzt. Die App bietet ein interaktives Tutorial mit englischer Sprachausgabe und deutschem Untertitel. 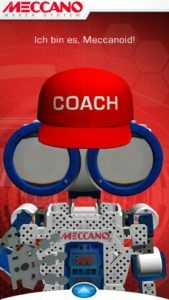 Ansprechend für Kinder ist hier der „Coach Meccanoid“ virtuelle Roboter, der einen Schritt für Schritt an die Benutzung der App heranführt. Ist der Meccanoid für den Einsatz im Klassenzimmer geeignet? Jein. Mit einer Bauzeit von 5-6 Stunden dauert der Aufbau viel zu lang für den Unterricht. Das Anlernen von Abläufen durch Bewegung des Roboters bietet keinen Lerneffekt. Das Verwenden der integrierten Sprachsteuerung und Dialog-Funktion (die bei mir auf Deutsch nicht funktionieren wollte), ist auf Grund der Lautstärke in einem Klassenraum nicht verwendbar. Drag und Drop Programmierung ist sicherlich für den Unterricht geeignet, leider fehlt es an Aufgabensätzen oder Anleitungen für den Unterricht von Meccano. Mit etwas Vorbereitung lässt sich hiermit aber der Einstieg in einfach Programmierungsabläufe unterrichten. Hoffnung auf zusätzliche, fortgeschrittene Funktionen macht das durch Meccano zur Verfügung gestellt Downloadportal für „Open Source Programmierung“. Hier finden sich Beispielprojekte und Bibliotheken zur Ansteuerung des Meccanoid durch Dritthersteller Hardware. Soweit mein Eindruck vom Meccano Meccanoid XL 2.0. Solltet Ihr Fragen oder Anregungen haben, nutzt gerne die Kommentarfunktion. Bilder und Videos vom Aufbau folgen hier in Kürze. 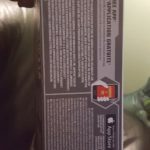 I want to share all the information about the Meccanoid XL 2.0 you can find on the packaging. If you are interested in this robot, here you can find everything that is visible from the outside. 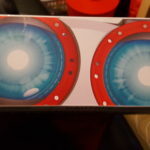 An unboxing and Building Video plus a written review needs some more editing before you will see it here @ robots-blog.com. The official specifications will follow in a next Post.